Anderson will discuss the role of sound and music in her own work as well as in some of the scores she has written for other films. Included will be Carmen, What you mean We? O Superman, Beautiful Red Dress, Personal Service Announcements, Chalkroom and Heart of a Dog. 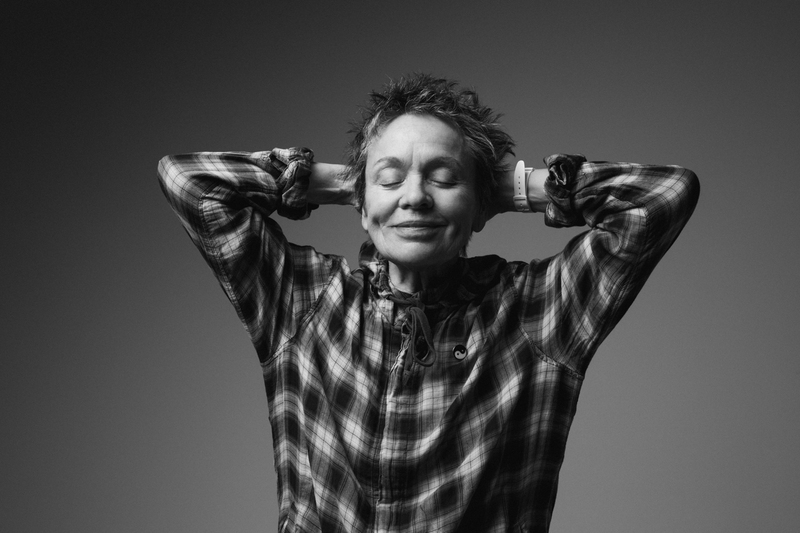 Laurie Anderson’s new book All the Things I Lost in the Flood is a series of essays about stories and language. In celebration of the publication of the book (released by Rizzoli in February ‘18) the artist will present a limited number of performances. The performance All the Things I Lost in the Flood includes visual images- many of them previously unpublished- as well as intimate performances with commentary of some of her iconic work with voice, electronics, codes, narrative styles and digital language. The evening also includes accounts of many of the artist’s projects, operas, installations and inventions as well as an inside look at the artist’s methods, strategies, failures and Plan B’s. A book about performance comes to life again as a performance. Copies of All the Things I Lost in the Flood will be available at the show. Chalkroom is a virtual reality work by Laurie Anderson and Hsin-Chien Huang in which the reader flies through an enormous structure made of words, drawings and stories. Once you enter you are free to roam and fly. Words sail through the air as emails. They fall into dust. They form and reform. In 2002, Anderson was appointed the first artist-in-residence of NASA which culminated in her 2004 touring solo performance “The End of the Moon”. Recent projects include a series of audio-visual installations and a high definition film, “Hidden Inside Mountains”, created for World Expo 2005 in Aichi, Japan. In 2007 she received the prestigious Dorothy and Lillian Gish Prize for her outstanding contribution to the arts. In 2008 she completed a two-year worldwide tour of her performance piece, “Homeland”, which was released as an album on Nonesuch Records in June 2010. Anderson’s solo performance “Delusion” debuted at the Vancouver Cultural Olympiad in February 2010 and will continue to tour internationally into 2011. In 2010 a retrospective of her visual and installation work opened in Sao Paulo, Brazil and later traveled to Rio de Janeiro. In 2017 Mass MoCA’s Building 6 opened, beginning a fifteen year rotating exhibition of work from Anderson’s archive as well as a platform to present new works. Included in 2017’s opening, Anderson and Chien-Chen Huang premiered their first collaborative VR works “Chalkroom” and “Aloft”. “Chalkroom” has been featured in film festivals all over the world including The Venice Film Festival where it won the award for “Best VR Film” under its Italian title “La Camera Insabbiata”. Anderson continues to tour her evolving performance “Language of the Future” and has collaborated with Christian McBride and Philip Glass on several projects in 2017. Anderson continues to work with the activist group “The Federation” which she co-founded in 2017. In February of 2018 “Landfall”, a collaboration between Anderson and Kronos Quartet was released through Nonesuch Records. Commissioned by Kronos Quartet in 2013, the work was inspired by the devastating effects of Hurricane Sandy. Also in February Rizzoli released “All The Things I Lost In The Flood” a book of images and a series of essays about pictures, language,and codes.